"Get 4 channels of premium audio into your computer...without paying a premium." 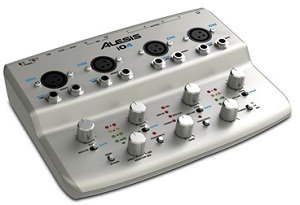 So opens the press release from Alesis on its new iO4 USB interface. It certainly shouldn't be lacking with a 24-bit analog-to-digital converter on board. The 4-channel layout looks uncluttered and simple, with a small enough footprint for use on my home desk and the ability to fit into the average laptop bag. Cut it down to 16-bit conversion and the iO4 will record or monitor as many as 8 channels of digital audio over the USB cable. The preamplifiers in Alesis' design are discrete and uncoloring. Each of the four inputs includes its own XLR microphone input, a 1/4" TRS input for external effects units and a 1/4" inch TS jack that works with line-level sources and can accommodate direct connection of guitars. The iO4 also features 48-volts of phantom power surging through it's four inputs, more than enough to power any microphones I know. The iO4 also features a set of four output channels, giving users the ability to connect a second set of reference monitors or route audio to external effects, giving the iO4 a bit more of a "full mixer" feel. The headphone output remains on its own channel for remote tracking and alternative playback. The iO4 has input and output jacks for MIDI instruments, too, allowing users to plug in keyboard and pad controllers, workstations, or other MIDI-compatible devices that my be working with software or external sound generators. The iO4 comes complete with a copy of Steinberg Cubase LE digtal audio workstation (DAW) software. Cubase is one of the most popular DAWs in the world thanks to its intuitive approach to composing, recording, editing and mixing. In addition to the included software, the iO4 is compatible with virtually all audio and MIDI software. The iO4 and Cubase are compatible with Mac OS X, Windows XP, Windows Vista, and they have officially announced compatibility with Windows 7.